Prepping for my radio show on Wednesday the contrast could not have been more clear. As I sat in my studio with the wall-sized monitor behind me lit with the rapidly changing headlines of the day I could not help but be struck by the divide playing out in the day’s news cycle. 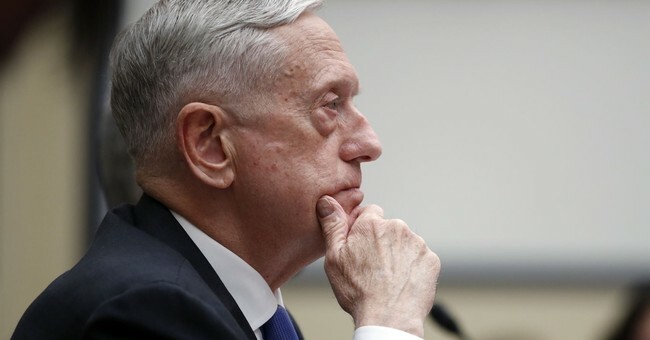 In the James S. Brady press briefing room at the White House, Secretary of Defense James “Mad Dog” Mattis looked anything but a former fierce general with a flare for sometimes going off script and routing his enemies by mere intimidation. In fact his tone and pleas much more conversational and pleasant, simply, quietly, without much fanfare, was making his case for the prioritization of funding for the military. He discussed how such budget uncertainty has an effect on troop morale. He was asked about and answered how yet another shutdown would impact operations. He pledged to spend the money with the greatest discernment and stewardship possible. He put forward the needs the military currently faces. He went long on the need to revamp our nuclear arsenal. He spoke bluntly about the need for our enemies not to miscalculate our capacity. In short it should have been something every American — who desires to see and keep us strong — should’ve been sympathetic to. On the other side of the mall Nancy Pelosi, the Democrat minority leader in the House, was filibustering for a number of hours on why no such spending allowances should go through. They shouldn’t, she argued, unless we gave in to her demands for allowing 700,000-3,000,000 non-citizens to stay in America, gain full benefits of American life, and even become U.S. citizens. She argued for this even though each of these individuals have had the chance for numbers of years to begin the citizenship process and for many could have completed it long before now—but for some reason chose not to. Here just two weeks since the last shutdown, a Democrat leader was holding court threatening the needed funding for our military—and funding that her colleague in the U.S. Senate had already agreed to—unless her pet project of DACA be completely agreed to and adopted post haste. Whether or not such stunts are ever successful is always a debate for historians and professors. The assessment I take away from it is one that fundamentally speaks to our greatness as a nation. Because America as an experiment is big enough for really competent, calm, and level headed leaders—sometimes ones who’ve even literally made our enemies sweat their own deaths—to go to the people directly and explain why we should be especially focused on approving the funding for our nation’s defense. America can also absorb the caged-hamster-act that Ms. Pelosi pulled and realize that she’s actively defending the supposed “rights” of people she doesn’t even technically have the capacity to represent. Meanwhile effective public servants like Secretary Mattis are staring down ISIS in Syria and Iran, the Taliban in Afghanistan, mullahs that are out of control in Iran, Hezbollah and Hamas in the West Bank & Gaza, a fool in North Korea who wants to bring about a nuclear incident, and an ever growing threat from Russia and China over territory, currencies, gold and oil. While Nancy Pelosi plays “Ms. Smith Goes To Washington” (for people who aren’t Americans,) actual American heroes are trying to protect us from the next cataclysmic encounter if we can show enough strength to stave it off. Pelosi pretends to be doing her job. Mattis is just asking the government and our elected leaders to give him the tools to genuinely do his. And while she will get paid if another shutdown occurs, he will have to notify active duty non-tour troops that they may miss a check or two. As the ones who employ both it’s on us to make sure that we effectively set the right priorities for them, so that there is no misunderstanding as to why it was more urgent to fund our military than to give extended benefits and citizenship to those who could’ve cared for that on their own all along.